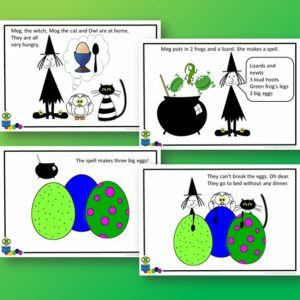 Meg’s Eggs by Helen Nicoll and Jan Pienkowski is another great book in the meg and Mog series. 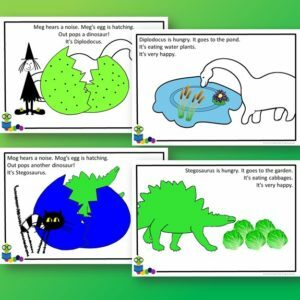 Meg makes a spell to make eggs for dinner but it all goes wrong when the eggs hatch and out come DINOSAURS! 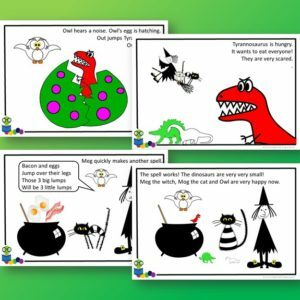 The story is full of bright colours and shapes and is perfect for a language focus on colours, shapes, food, animals or halloween. The story also ties in nicely with Easter. 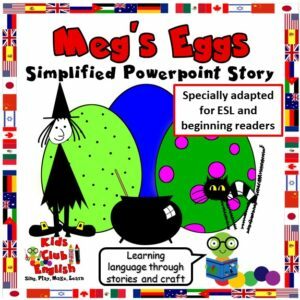 Enjoy this simplified version of Meg’s Eggs. Meg, Mog and Owl have an interesting time when a dinner time spell goes wrong!